From the author of the international phenomenon The Shadow of the Wind, comes a riveting masterpiece about love, literature, and betrayal. CARLOS RUIZ ZAFÓN, author of The Shadow of the Wind and other novels, is one of the world’s most read and best-loved writers. His work has been translated into more than forty languages and published around the world, garnering numerous international prizes and reaching millions of readers. He divides his time between Barcelona and Los Angeles. The novel begins with David's recollection of the first time he tasted "the sweet poison of vanity" by writing for a living. How much of his career is fueled by vanity versus poverty? Why was it so difficult for him to heed Cristina's warnings about selling out to greedy publishers? 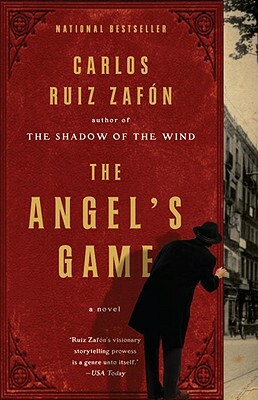 Like Carlos Ruiz Zafón's previous novel, The Angel's Game is written in the first person. What does David reveal about his view of the world as he tells us his story? How might the novel have unfolded if it had been told from Andreas Corelli's point of view? Sempere influenced David's life by giving him a copy of Great Expectations. Later returned to him by Corelli, the book still bore the bloody fingerprints of David's father. How did David's life resemble a Dickens novel? How was he affected by his parents' history? How did books and booksellers save him? What is the most memorable book you received as a child? Discuss the Cemetery of Forgotten Books, described especially vividly in chapter 20 (act one). What do the contents of the cemetery say about which books have long lives, and which ones are overlooked? What is required to honor the soul of a book, applying Sempere's belief that a book absorbs the soul of its author and its readers? What is the common thread in each of Corelli's tactics for luring David? How did you interpret his "dream" of Chloé? What made David a vulnerable target? What aspects of his identity does David have to leave behind when he becomes Ignatius B. Samson, author of City of the Damned (chapter 8, act one)? What does The Steps of Heaven say about who he wants to be and who Irene Sabino became? How does Pedro Vidal justify his exploitation of David, stealing the woman he loves and capitalizing on David's prowess as a writer? How did your opinion of Vidal shift throughout the novel? Does he redeem himself in chapter 22 (act three)? Describe someone whom you idolized early in your career who later proved to be untrustworthy. In chapter 24 (act one), Corelli reveals his plan to David, describing religion as "a moral code that is expressed through legends, myths or any type of literary device." Does this definition match your experience with religion? What do Lux Aeterna and Corelli's project indicate about faith and the written word? How did you react to the revelations about Ricardo Salvador at the end of chapter 14 (act three)? What had your theories been about Corelli's network? Explore the novel's title. Ultimately, who are the angels in David's world? What are the rules of Corelli's game? Who are its winners? Discuss Barcelona, especially the traces of renowned architect Antoni Gaudí, as if the city were a character in the novel. How do the tower house in Calle Flassaders (first described in chapter 8, act one) and Vidal's Villa Helius, along with the cathedrals, cemeteries, Las Ramblas, and other locales, set the tone for The Angel's Game? What is the effect of reading a novel about a novelist? What truths about the intersection of art and commerce are reflected in the story of Barrido & Escobillas and in their subsequent demise at the hands of an even more controlling publisher? If you had been Inspector Victor Grandes, would you have believed David's story in chapters 18 and 19 (act three)? How did you interpret the novel's closing scene, particularly the presence of Cristina? Throughout the novel, how did David reconcile the ideal of Cristina with the realities of circumstance? What is special about the bond between David and Isabella? What do they teach each other about love? If you have read The Shadow of the Wind, discuss your reactions to Daniel's heritage, revealed in the epilogue.